We are custom, residential tile installers focused on quality and craftsmanship. You can expect a high end finish that exhibits your individual taste and preferences. Please, browse our site and check out our blog which is a valuable point of reference. We are experts at guiding you to the bathroom of your dreams. Our latest master bath in Suwanee, GA was another bathroom nightmare that we were called in to rescue! The fly by night, remodeling goblin was out in force on this one, but we turned it around as we have become known for…We are heroes in the remodeling business! GET THE FULL STORY BY CLICKING HERE! Take a walk through an amazing luxury master bath…You want custom? We will give you custom! When you need a scrupulous hand, the guys at Hamilton Tile can help you. Let us guide you through your next bathroom remodel. 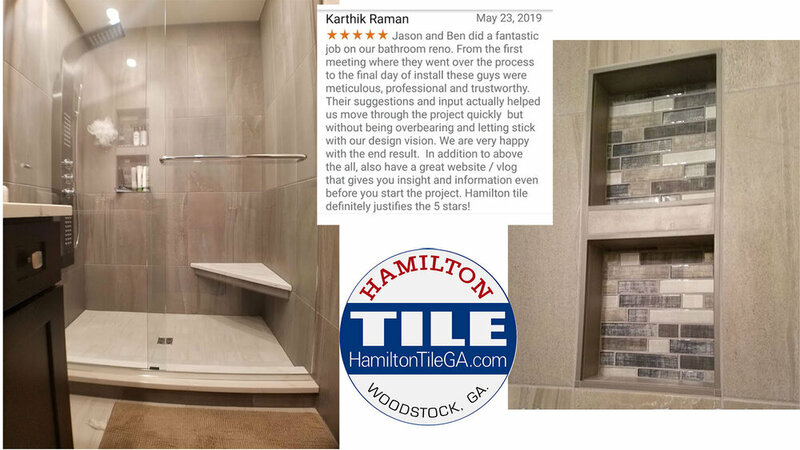 Hamilton Tile is a bathroom remodeling company in Woodstock, GA. With a proven track record of success, we specialize in high end, custom tile work. We guide you in attaining security in your old age. Comfort is key to a pleasant retirement. We build comfort! Click on the video now to view the full walk through video. CLICK HERE to view before and after pictures, and the Five Star Review! Mayhew Bathroom remodel Marietta, GA. 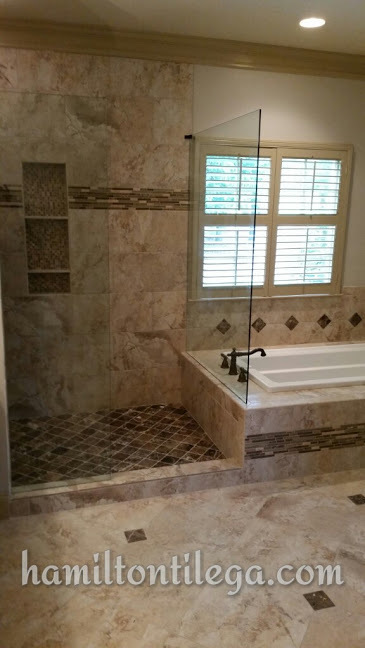 This is a master bathroom remodel in Marietta, GA. Watch the video for a closer look and to understand the process that produces a product that these homeowners are quite proud of. Check out the contrast between old and new! Read the customer review HERE. 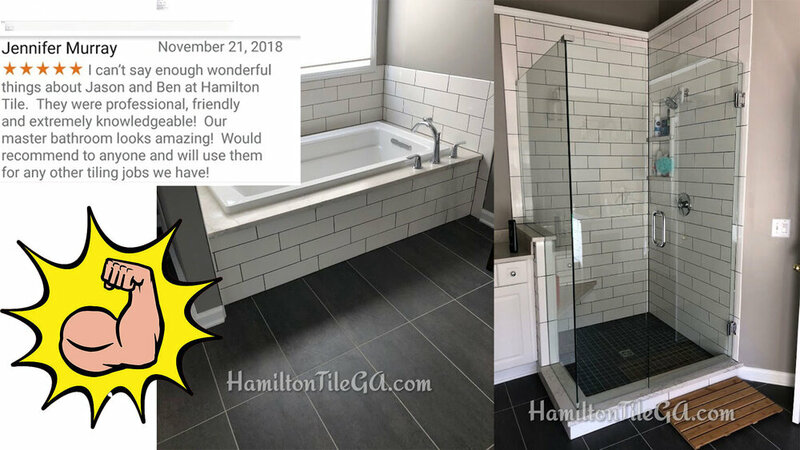 An advantage of using Hamilton Tile for your next bathroom remodel: transparent, responsive communication with reputable, established craftsmen. Click here to see the handy overview of this project. 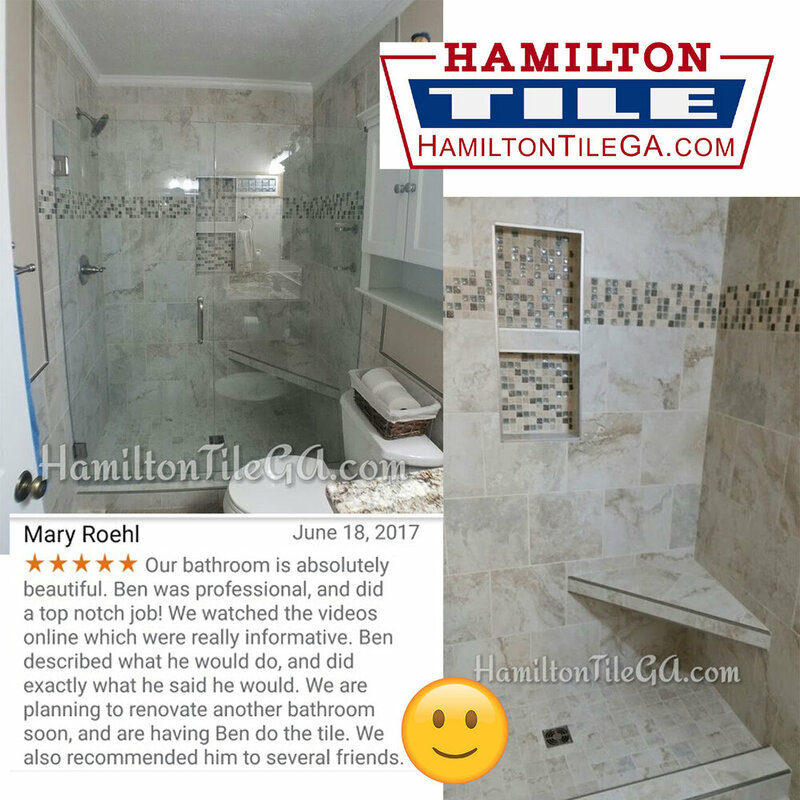 An advantage of using Hamilton Tile is we take the worry and suspicion out of the remodeling process. We do this by employing the 'Handbook method' which standardizes our installation process. Jason Hamilton is also a trade school graduate and has 20 years in the tile business. Our tile installers are Certified Tile Installers and we are NTCA members. You want credentials, we have them. If you care about how your project is put together, we want to work with you! Many companies focus on volume/production, we focus on craftsmanship and quality because with tile, you have only one shot to build it right. How can we help you? Maybe it’s by saving your sanity on your next tile project! 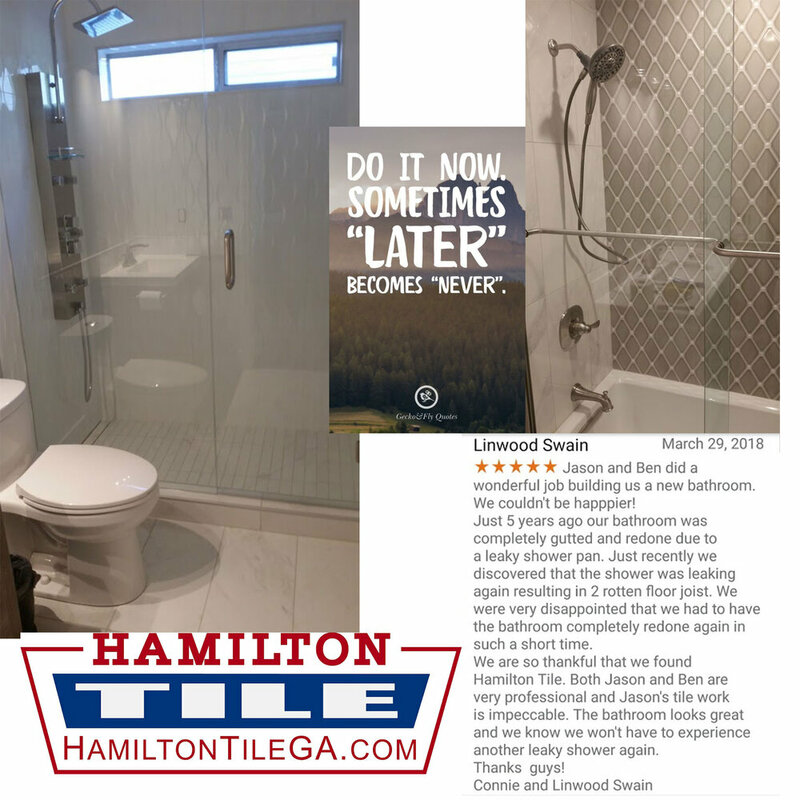 Combining experience, attention to detail and relationship based customer service, Hamilton Tile will provide you with a stunning bathroom remodel. Let us alleviate the discomfort of hiring the wrong contractor. Here are the top mistakes that homeowners make when hiring a tile service. When you think of a finished tile job, very often you'll regard the looks as the most important aspect. I contend that although the aesthetics are critical, the longevity and functionality of tile is really why it has been the architect and builder's choice throughout history. We have the foresight that ensures our tile work lasts the lifetime of your home. Let's get this process started today. Our time is spoken for months in the future and because each project receives our full attention, it's preferable to schedule us in advance. Having problems finding a qualified installer? Click HERE. We are the antithesis to the modern builder business model. We keep our process simple, we are thorough, competent and conscientious. Click here for a short walkthrough of this bathroom. HamiltonTileGA.com latest master bath in Milton, GA. Here is a before and after video of another bathroom remodel in Milton, GA. 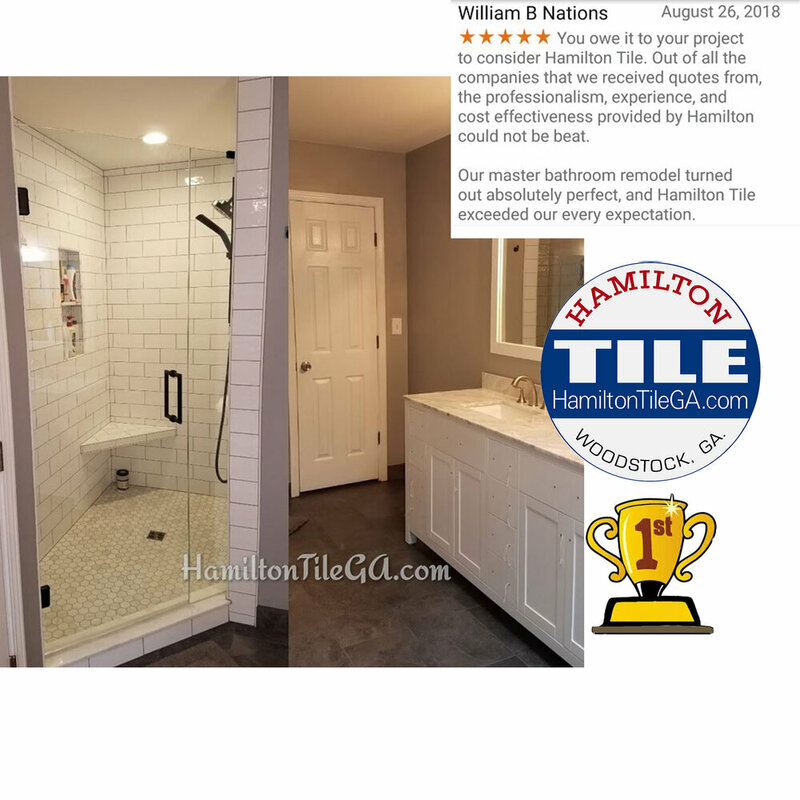 Compare the difference between a builder-grade basic blowout special and the extraordinary work of the proven specialists at Hamilton Tile. 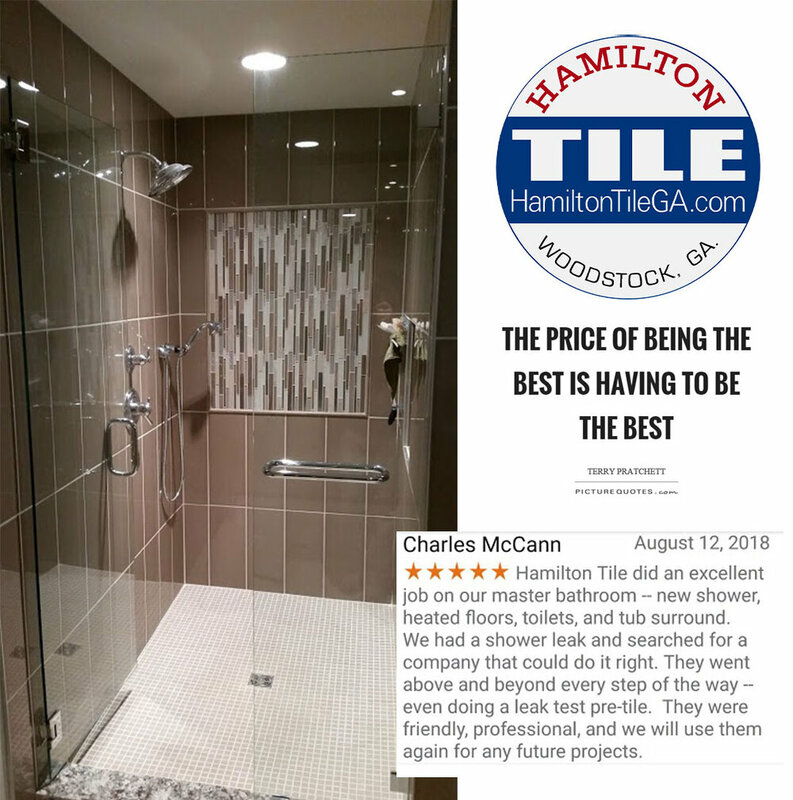 “You owe it to your project to consider Hamilton Tile. Out of all the companies that we received quotes from, the professionalism, experience, and cost effectiveness provided by Hamilton could not be beat. We build designer custom plumbing fixtures. We take high priced raw material and turn it into a show piece. Our 'full service' tile job includes a ten year warranty on all our work, because for us longevity is our main priority. Click here for a HD video walk through of this bathroom and the guest bath in the same home. This is a steam shower and it is one of a range of very technical tile projects that we specialize in. Within our prep section you can find photos of this being built. Schluter Systems is a proprietary shower building company and we are experts at using this method to build bathrooms. Contrary to popular belief, tile and cement board are not waterproof. Schluter Systems has been a true ally to our business for years now, providing a lasting moisture management system in our bathrooms that protect your home from an average of 1100 inches of water a year, per person. Click here to read about the installer advantages of using Schluter Systems. 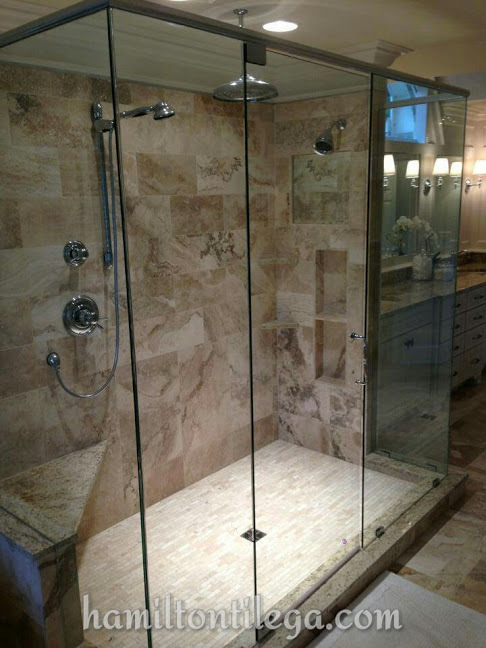 A custom shower will allow you security in your old age. 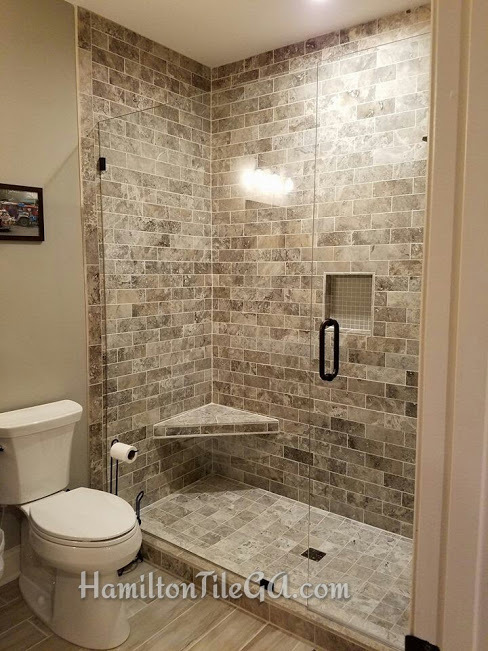 It is custom built so it's no problem adding grab bars or small tile on the floor to secure your footing. Don't want to step over a curb? Perfect. We have the training and experience to make your shower 'CURBLESS' Check out this short video to learn how we do it! This job was GC'd by the homeowner and if you want to cut out the middle man, we're willing to work with you! Looking to save some money on your next remodel? Click here for a very informative blog post about that subject, exactly. We also work with natural stone. There is an added labor and material cost to natural stone but it has its advantages. It really looks classy too. This is one with all the bells and whistles. "Our bathroom is absolutely beautiful. Ben was professional, and did a top notch job! We watched the videos online which were really informative. Ben described what he would do, and did exactly what he said he would. We are planning to renovate another bathroom soon, and are having Ben do the tile. We also recommended him to several friends." We will give you a fair bid, according to our standards of finish. We take our time, allow for drying time and each job is generally finished before we go on to the next. The value is in hiring the specialists directly, cutting out the middle men. “Jason and Ben did a wonderful job building us a new bathroom. We couldn't be happpier! Just 5 years ago our bathroom was completely gutted and redone due to a leaky shower pan. Just recently we discovered that the shower was leaking again resulting in 2 rotten floor joist. We were very disappointed that we had to have the bathroom completely redone again in such a short time. We are so thankful that we found Hamilton Tile. Both Jason and Ben are very professional and Jason's tile work is impeccable. The bathroom looks great and we know we won't have to experience another leaky shower again. 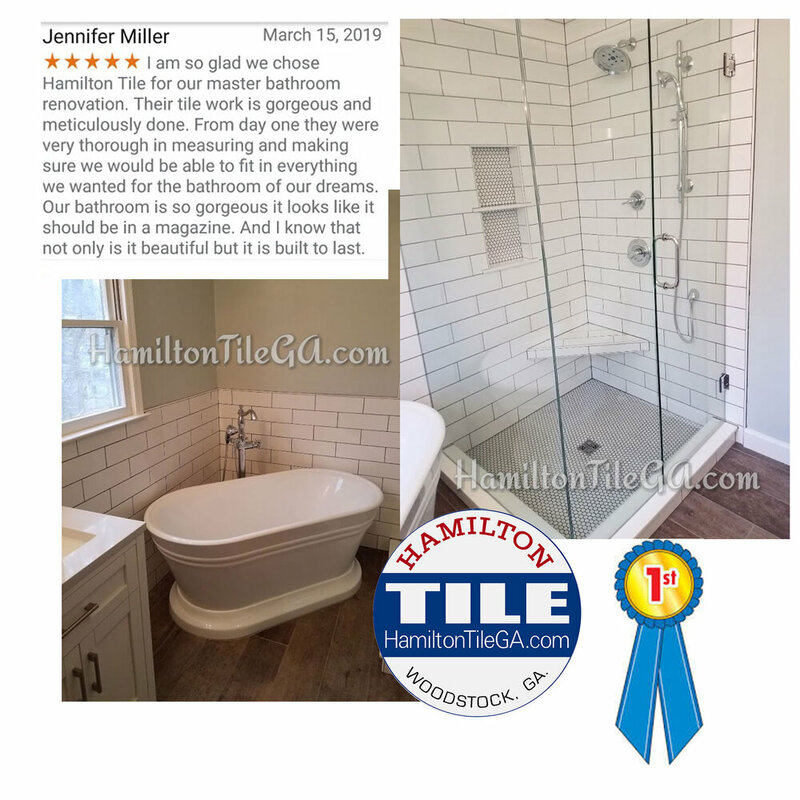 When you hire Hamilton tile you are purchasing our high standards, our proprietary methods, and a mindset that consistently produces a high end finish.